Press release from our member groups Students United for Palestinian Equal Rights- University of Washington and The Rachel Corrie Foundation for Peace and Justice. You can read the open letter to Jon Huntsman signed by more than 100 groups here. Republican presidential hopeful, governor of Utah, and board member of the company that manufactured the bulldozer used to kill Washington state college student and nonviolent protester Rachel Corrie, Jon Huntsman will address 45,000 attendants of University of Washington’s 138th graduation ceremonies. An open letter signed by over 100 student groups, alumni, faculty, and community organizations including the parents of Rachel Corrie explains CAT’s role in Palestine. 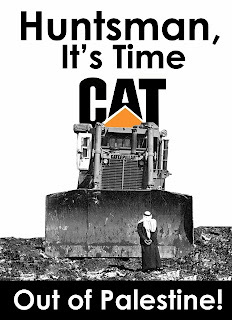 Amin Odeh of Seattle group Voices for Palestine adds, “Caterpillar bulldozers in the Westbank and Gaza destroy homes, crops, and crush any hope for Peace.” The letter asks Huntsman to use his position on the board to “address the continuing harm caused by Caterpillar’s machines in Palestine” by “suspending sales to the Israeli military…until guarantees are received that their equipment will not be used to violate international law or commit human rights abuses.” The letter also asks Huntsman to meet with representatives of the Rachel Corrie Foundation and other signatories.